“British Attempts to Forge a Political Partnership with the Kremlin, 1942-3,” by Martin H. Folly (Journal of Contemporary History, 53:1, 2018) discussed a stalled initiative. In February 1943 Joseph Stalin suddenly proposed plenary discussions of the postwar settlement. The idea was immediately spiked by an angry Winston Churchill. “Much mischief will be made of this,” a reader writes. “Churchill was hardly wrong to drop postwar discussions at that stage of the war. But his enemies will pick this up and run with it: Stalin, trying to be helpful, is thwarted by a viciously screaming Prime Minister.” But there is more to Mr. Folly’s piece than meets the eye. Mr. Folly is well equipped to consider the matter. He is a senior lecturer at Brunel University, author of Churchill, Whitehall and the Soviet Union, 1940-45 (2000), and other works on wartime diplomacy. Folly looks at the event in the context of Anglo-Soviet relations. Previously, the event has been mentioned only as an incident in the relationship between Churchill and Eden. No one has been a more consistent opponent of communism than I have for the last twenty-five years. I will unsay no word that I have spoken about it. But all this fades away before the spectacle which is now unfolding…. Any man or state who fights on against Nazidom will have our aid…. It follows therefore that we shall give whatever help we can to Russia and the Russian people. His pledge reflected the progression of Churchill’s views. A leading anti-communist, he had moderated his stance with the rise of the more immediate and greater danger of Nazi Germany, Well before the war started in 1939, he had advocated exploring common policy with Moscow against Hitler. But the precise nature of Britain’s relationship with the totalitarian and suspicious Soviet Union would bedevil Churchill and the British throughout the conflict. Until 1943, the Foreign Office had encountered little success in discussions with the Soviets about postwar plans. The German invasion had made them allies of a kind, without much enthusiasm. Early on, amidst doubts that it might be wasted, Britain provided the Russians with supplies and equipment. Stalin wanted more. By late 1941 he was complaining to London about “lack of clarity” in their relationship and the need for talks. Foreign Minister Eden undertook an “exploratory mission” to Moscow in December 1941. Little progress was achieved. Eden hoped for a “vague declaratory treaty,” while Stalin wanted to discuss “concrete issues.” Among these were recognition of the Soviet frontiers established by their conquests in Poland and the Baltic States during 1939-41. Following U.S. entry into the war, Folly writes, an “extensive and acrimonious debate” ensued between the Anglo-Americans over the Soviet demands on postwar frontiers. The inclination to postpone postwar questions continued throughout 1942. Churchill’s visit to Moscow in August, the first-ever meeting between Soviet and British heads of government, was limited to strategic and military matters. Eden did not accompany the Prime Minister since his presence might have necessitated a discussion of political issues Churchill wanted to put off. In his war memoirs Churchill recalled going to “this sullen, sinister Bolshevik State that I once tried to strangle at its birth, and which, until Hitler appeared, I had regarded as the mortal foe of civilized freedom.” It was quite a contrast to his view of America. Churchill was in Washington within weeks of U.S. entry into the war for comprehensive and fruitful talks; he delayed visiting Moscow for fourteen months, and the Soviets for their part were not entirely forthcoming on their military intentions. In late 1942, despite the sour atmosphere involving the Second Front, Stalin seemed to thaw, speaking positively about the “Grand Alliance.” The Foreign Office, which “eagerly grasped” at “any clues to Soviet policy,” considered this an opportunity to break through “the crust of suspicion” and “build a workable, rounded alliance.” In December 1942, Deputy Under-Secretary Orme Sargent, British Ambassador to Moscow Archibald Clark Kerr and middle- ranking Foreign Office officials met to discuss expanded Soviet cooperation. Eden and Permanent Under-Secretary for Foreign Affairs Alexander Cadogan agreed that Clark Kerr should “take soundings” of Stalin’s attitude towards postwar issues. 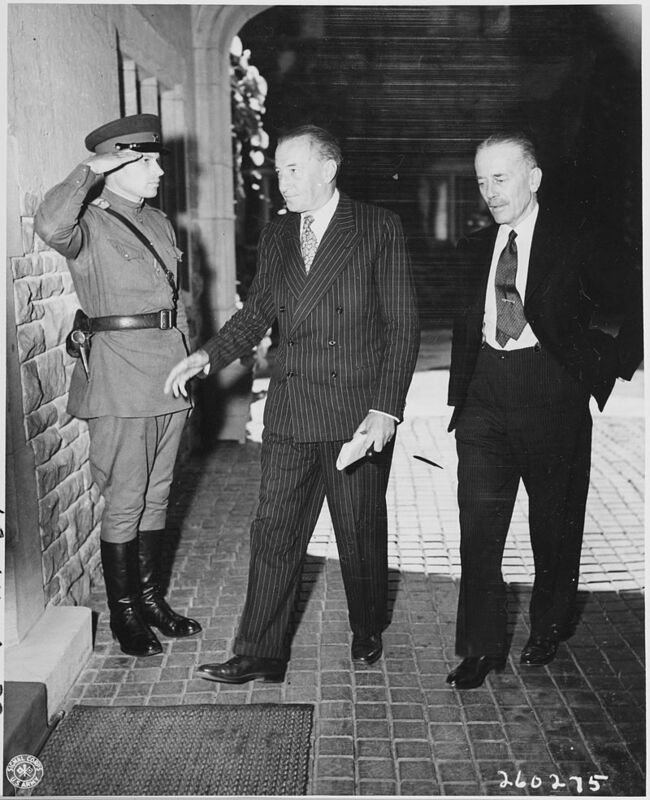 Clark Kerr who was charged with making contact in Moscow, rather than Eden speaking with the Soviet ambassador in London. In Moscow in February 1943, Clark Kerr saw Molotov and then Stalin. The Foreign Office had expected only informal discussions. To their consternation, while Eden had advised “to go slow” on such negotiations, Stalin proposed comprehensive “three-power talks” on postwar issues. …nor did London and the Moscow Embassy always see eye to eye…. But the evidence shows certain consistent assumptions. Soviet suspicions could only be allayed by a policy of cautious reasonableness that gave he Russians as little cause as possible for legitimate complaint. Such a policy might take some time to work, but the home was that it would have a cumulative effect which would make postwar collaboration possible if not easy. (JCH, 16: 521-40). 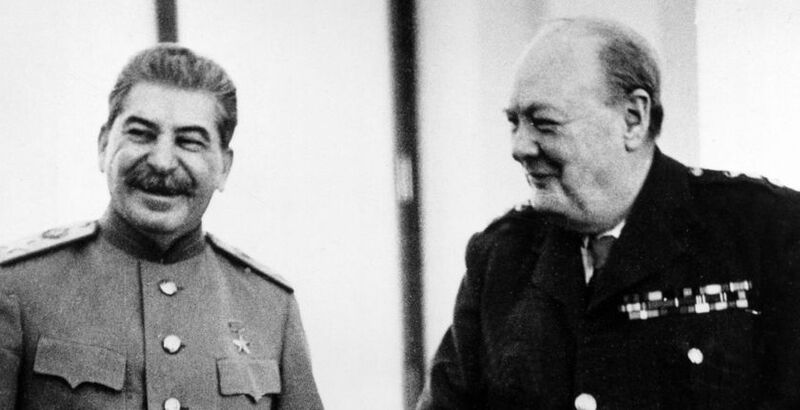 Stalin’s proposal “inevitably reached Churchill’s eyes” and the Prime Minister, with justice, reacted furiously. The overture had been undertaken without his knowledge and contrary to the policy of putting off such talks. Upon finding out, Churchill, recovering from pneumonia, “emitted a series of the most vicious screams from his sickbed and ordained that the whole subject of postwar matters be dropped at once like the hottest of hot bricks.” The Foreign Office’s overture ran counter to his attempt to treat Stalin as a “comrade-in-arms” and “fellow warlord,” intent as he was to concentrate on the defeat of Nazi Germany. That quotation may well appear in some future Churchill critique, but it has only one (questionable) source: Christopher Warner, head of the Foreign Office’s Russian policy department, to Clark Kerr on 16 March 1943 (FO 800/301). Unless Mr. Warner was at Churchill’s bedside, this can only be viewed as hearsay. There is no doubt however that Churchill was deeply distressed. The PM, Folly continues, directed his ire at Eden, who “acted like a naughty child” and tried to pass the blame to Clark Kerr and F.O. officials. The Prime Minister, rightly wished to control his government’s communications with Stalin. Churchill was aware that Stalin would soon be given “some very unpalatable news about Anglo-American strategic decision, and the suspension of convoys to the USSR,” which would make “raising political issues at such a time … hardly likely to be productive, or conducive to diplomatic give-and-take.” Clearly, from his plenary position, Churchill grasped broad facts which the Foreign Office did not. Martin Folly has contributed to historical literature on the Anglo-Soviet relationship by illustrating an example of lower-level British officials attempting to advance the alliance. Our previous understanding of the episode—Churchill intervening to halt Eden’s initiative—must stand revised. Indeed, Eden and the Foreign Office were already hesitating about proceeding before Churchill learned of the matter. The British were unwilling and unready to enter into the formal negotiations Stalin proposed; they had made the approach hoping only for informal and vague conversations. Churchill’s intervention served to confirm the doubts the Foreign Office was already having about their initiative. Mr. Tolppanen is Professor of Library Services, History Librarian and head of Circulation Services at the Booth Library, Eastern Illinois University, Charleston Illinois. He is the author of a definitive study, Churchill in North America, 1929.